When I saw this photo I had to work hard not to throw up. Then, I thought the person who was waving the sign was probably a confessing Christian and that led me to search for some Biblical wisdom which would justify such a comment. 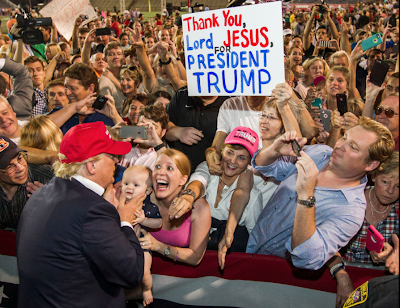 Anyone with any knowledge of the New Testament knows immediately that there is nothing in that collection of tall tales and extended letters that would provide a basis for thanking the "Lord Jesus For President TRUMP." D. J. Trumpf - "I'm Gonna Catch You, You Little Terrorist!"